Chelsea Ladies' hopes of reaching the Champions League quarter-finals suffered a big setback as they lost the home leg of their tie against two-time winners Wolfsburg. Claire Rafferty's third-minute own goal gave the German side the lead. Babett Peter headed into her own net after the break to level the score, but substitute Caroline Graham Hansen's low finish gave the visitors victory. Chelsea must now score at least twice in Germany on 18 November. The new Women's Super League champions made a nervy start and conceded an early goal when they failed to clear a free-kick and Nilla Fischer's poked shot was deflected in by England left-back Rafferty. 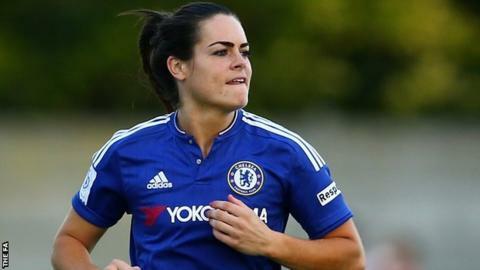 Chelsea defender Gilly Flaherty then appeared to elbow Vanessa Bernauer on the half-hour mark, as Wolfsburg frustrated the hosts by pressing high up the pitch. The Blues drew level after half-time through Peter's own goal and almost took the lead when Ji So-yun's shot was blocked and Fran Kirby fired narrowly wide. However, Hansen's goal put Wolfsburg - who have reached the semi-finals in each of the past three seasons - in control. "Four weeks between games showed in the first 45 minutes so I hope our Football Association do more to prepare better scheduling because if an English team is going to win the Champions League, we have to be more game ready. "It's geared to French, German and Swedish teams, and until we change that or listen to clubs like Chelsea we are always going to get knocked out in the early rounds. "It took us a while to get started, and it was a poor goal to concede. Other than that there wasn't a lot between the two teams. The difference at this level is that we had two glorious chances to score and didn't and they counter us and go 2-1 up. "For us to get a result at Wolfsburg is a tall order. We will create chances but we have been a bit vulnerable on the counter attack."